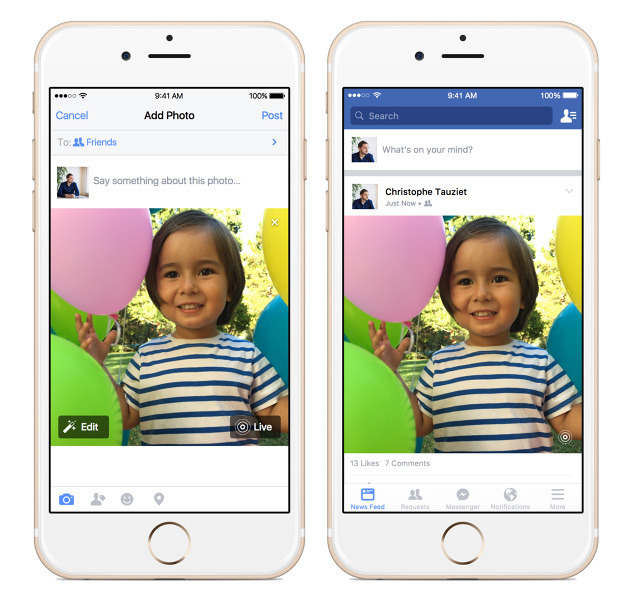 A small number of iOS 9 users should now be able to view and upload Live Photos, Facebook said. Although capturing and uploading in the format requires an iPhone 6s or 6s Plus, anyone in the testing pool should be able to access the content. Live Photos are marked with the format's signature "ripple" icon on compatible devices. People outside of Facebook's current support sphere —including other iOS users, and those on different operating systems —will only see a static image. In September, Apple promised that Facebook would launch Live Photos support by the end of 2015. Third-party support for the format is still extremely limited. The only other compatible app so far is Tumblr, which itself only gained the feature on Dec. 10. Live Photos are enhanced with a few seconds of video and audio, and so far limited to iOS devices. The technology was one of the centerpieces of Apple's iPhone 6s announcement on Sept. 9.